How I love you Calphalon, let me count the ways!! I recieved this gorgeous stock pot from Calphalon and couldn’t have been more thrilled. Our daughter is having a French Onion Soup fetish at the moment so I decided to indulge her with French Onion Soup Freezer Kits. She is 14 now and can pull these out of the freezer when ever she is in the mood, this winter and have a hearty and delicious meal. 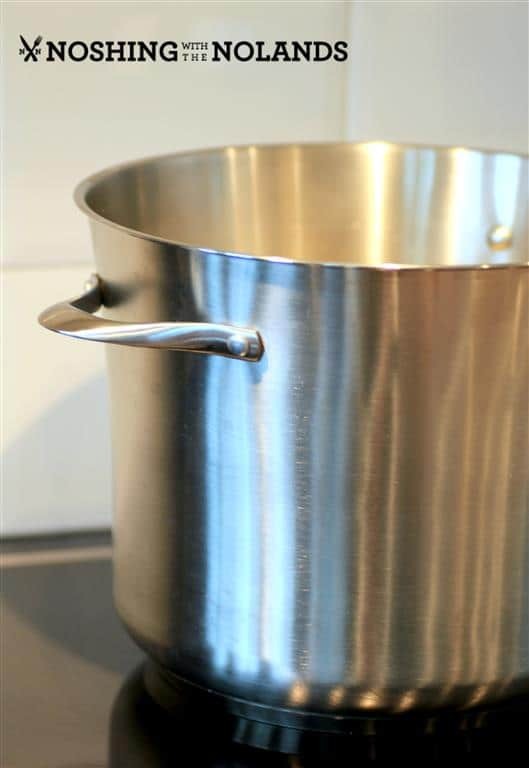 This gorgeous 12 quart stock pot made it easy to whip up a large batch of French Onion Soup. 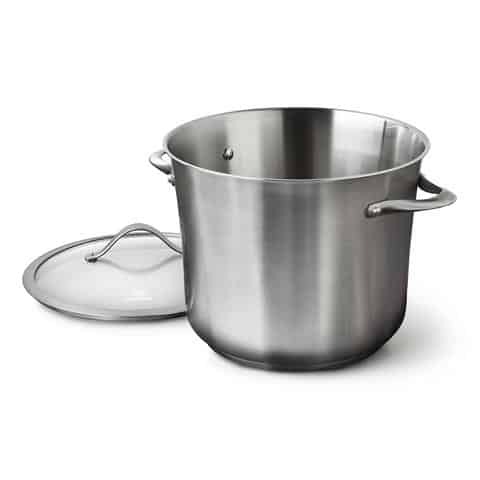 This large capacity pot is ideal for soups, stews or chilis. Something that we make all the time. I didn’t have a large pot anymore when we converted to induction cooking, so Calphalon kindly supplied me with this beautifully brushed stainless steel pot. With induction cooking or any heat source you want a responsive pot. The impact-bonded aluminum base on this pot is just that, responsive. Whether you are boiling rapidly or simmering slowly, the base of the pot is responsive to temperature changes. The pot has a lifetime warranty, is oven and broiler safe and is a dream to clean up in the dishwasher. I have to also say it is a pretty darn handsome pot!! You can see another gorgeous Calphalon product that I recieved, a saute pan in the post Chicken, Fennel and Artichokes with #Calphalon. I love the look of this gorgeous pot sitting on my stove!! Now onto my creation of these French Onion Soup Freezer Kits. 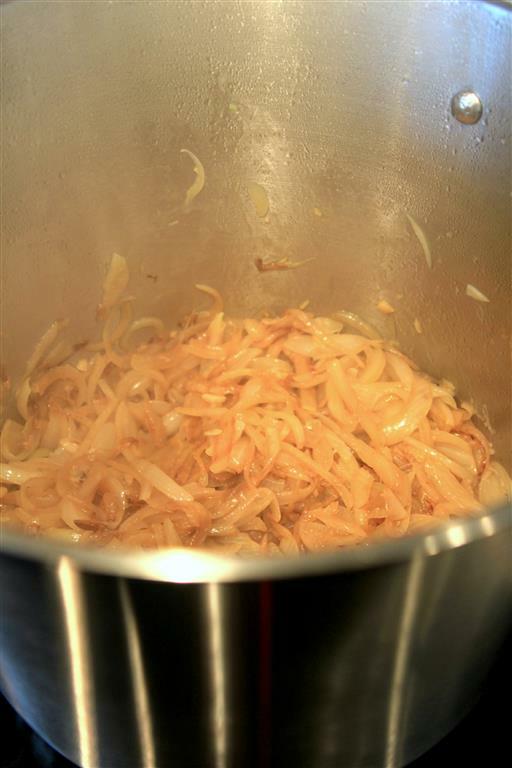 Here is a peek at the onions caramelizing!! I love the aroma and taste of caramelized onions, so good!! I went with a tried and true recipe from Julia Child and tweaked it to make more and then adapted it for my freezer kits. Grab a spoon and you can dive right in!! The kits consisted of 1 cup of French Onion Soup frozen in a small container. 1/3 cup of grated Swiss cheese in a small zipped sandwich bag and a large bag of frozen homemade croutons which you nip out 3-4 croutons for each bowl of soup. The soup is then microwaved in a bowl until thawed and hot, then topped with the croutons and cheese and broiled. A preteen or teenager can easily handle making this on their own. I hope you enjoy making these soups and check out the full line of Calphalon products. 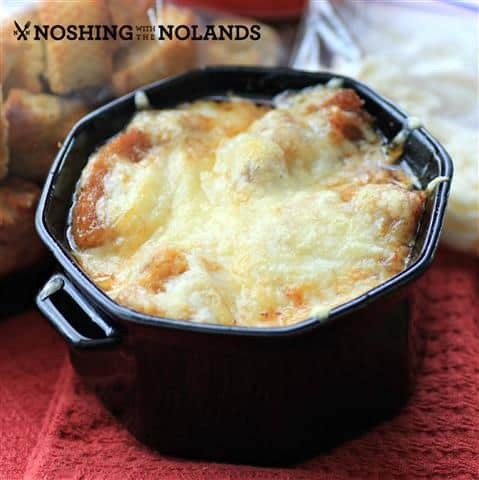 Delicious French onion soup frozen and made into convenient kits for ease. In a large stock pot over medium high heat melt the butter and oil together. Add teh onions, garlic and sugar. Reduce heat to medium and cook stirring occasionally for 10-15 minutes. Watch carefully as they can burn with the addition of the sugar. Cook until caramelized. Add the wine and raise heat and bring to a boil and cook for 3 minutes. Add the stock and bring to a boil again. Cover and cook for 1½ hours. Adjust seasoning with salt and pepper. Let cool. Fill containers for the the freezer. Preheat oven to 400F. Lay the French bread out on a cookie sheet with sides. Drizzle with olive oil and season with salt and pepper. Bake for 15 min. or until golden and crispy. Let cool completely on the cookie sheet and then store in a large zipped bag. Package gruyere into ⅓ cup portions in zipped sandwich bags. Freeze the soup, cheese and croutons. When ready to cook. Place the frozen soup in a microwave and oven safe dish. Microwave for 2½ minutes or until thawed and hot. 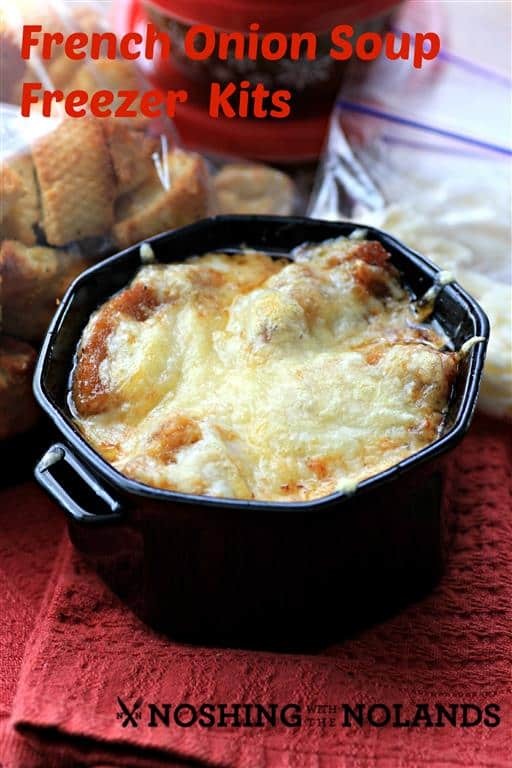 Top with 3-4 croutons and cheese and broil until bubbly and cheese is slightly browned and melted. 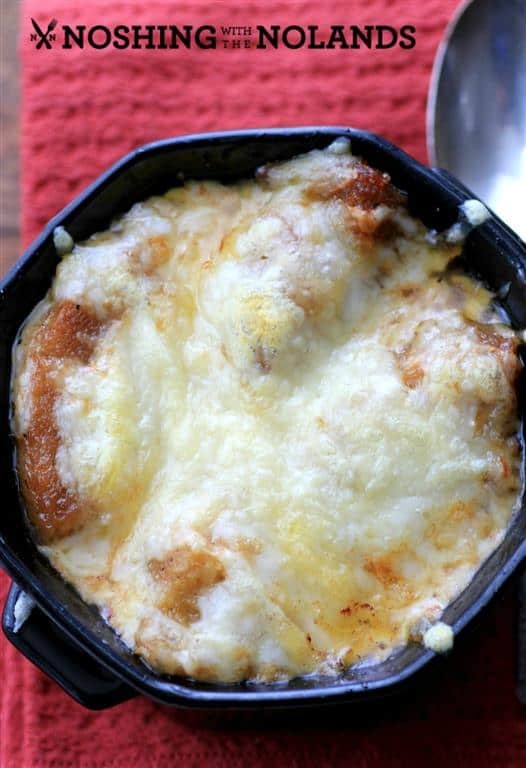 Tara, this is a wonderful adaptation of Julia Child’s classic French onion soup. I am a French onion soup fan. Sadly, my mom is too far away to make me freezer packs of it! You are sweet to do that for your daughter. 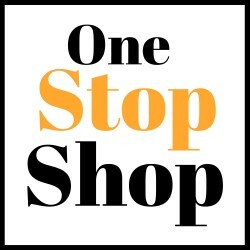 Glad I found your wonderful site! Thank you so much Suzy, love Julia Child recipes, and thanks for coming over!! We love this soup and this idea! Thanks so much for sharing. Tis soup looks dreamy good! G’day What a great recipe Tara and LOVE the #Calphalon brand! Yes, I sure do too, thank Joanne! That’s an outstanding stock pot and I love the idea of freezer soup. It’s just the two of us and neither wants to eat soup for a week. Thanks Maureen, I always have soup in the freezer, we love it!! French Onion Soup is such a classic. Your soup looks wonderful.